We have always tried to reflect upon, and analyse, our work and learning about digital storytelling, and to share those reflections and analyses appropriately, through journal articles, books and academic and other other publications. In addition, several others have written about our work in PhD and Masters’ theses. Here are links to some of them. 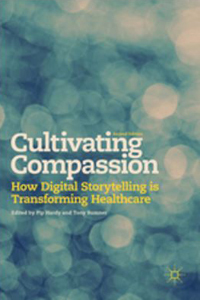 Edited by Pip Hardy and Tony Sumner, this book explores how digital storytelling can catalyze change in healthcare. 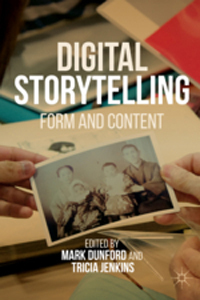 The chapter authors discuss various applications for this technique; from using digital storytelling as a reflective process, to the use of digital stories in augmenting quantitative data. Through six main sections this second edition covers areas including healthcare education, patient engagement, quality improvement and the use of digital storytelling research. 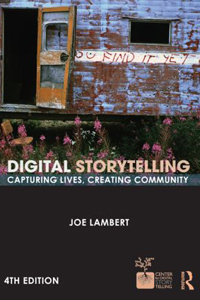 The chapters illuminate how digital storytelling can lead to greater humanity, understanding and, ultimately, compassion. This collection will appeal to those involved in delivering, managing or receiving healthcare and healthcare education and research, as well as people interested in digital storytelling and participatory media. 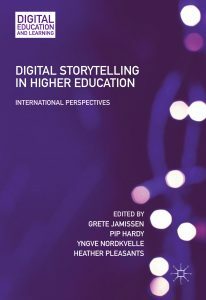 Edited by Grete Jamissen, Pip Hardy, Yngve Nordkvelle and Heather Pleasants, this book broadens the scope and impact of digital storytelling in higher education. It outlines how to teach, research and build communities in tertiary institutions through the particular form of audio-visual communication known as digital storytelling by developing relationships across professions, workplaces and civil society. The book is framed within the context of ‘The Four Scholarships’ developed by the Carnegie Foundation for the advancement and redefining of teaching, including the scholarships of discovery, integration, application, and teaching and learning. Across four sections, this volume considers the potential of digital storytelling to improve, enhance and expand teaching, learning, research, and interactions with society. 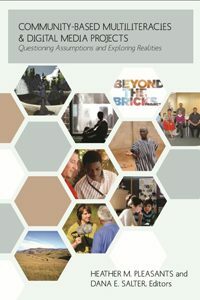 Written by an international range of academics, researchers and practitioners, from disciplines spanning medicine, anthropology, education, social work, film and media studies, rhetoric and the humanities, the book demonstrates the variety of ways in which digital storytelling offers solutions to key challenges within higher education for students, academics and citizens. It will be compelling reading for students and researchers working in education and sociology. Within community-based digital literacies work, a fundamental question remains unanswered: Where are the stories and reflections of the researchers, scholars, and community workers themselves? We have learned much about contexts, discourses, and the multimodal nature of meaning making in literacy and digital media experiences. However, we have learned very little about those who initiate, facilitate, and direct these community-based multiliteracies and digital media projects. In Community-Based Multiliteracies & Digital Media Projects: Questioning Assumptions and Exploring Realities, contributors discuss exemplary work in the field of community-based digital literacies, while providing an insightful and critical perspective on how we begin to write ourselves into the stories of our work. In doing so, the book makes a powerful contribution to digital literacies praxis and pedagogy—within and outside of community-based contexts.